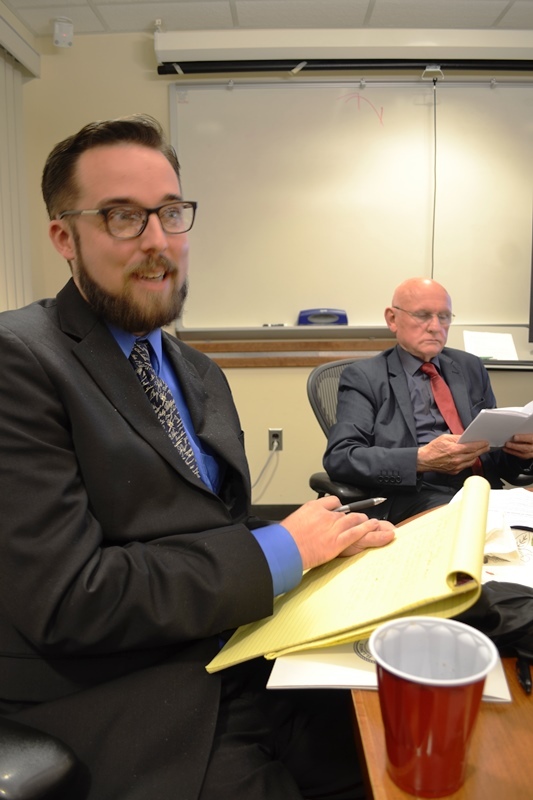 This article originally appeared on the Illinois State University's Department of Politics and Government website . The article was written by Arafat Kabir, and it was published on November 1st. All photos used in this re-presentation of the original article are from the original article. The European Union Center at the University of Illinois attends events such as this one to engage in learning about the issues and concerns of the European Union. How is the European Union (EU) commonly viewed in the United States? How efficiently does the union of 28 European countries function? Is there anything that the United States can learn from the European Union? These were some of the questions raised and discussed at a luncheon hosted by the Department of Politics and Government on October 28. 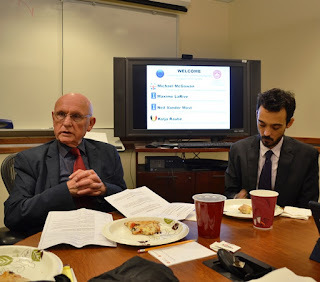 The round-table discussion was led by Michael McGowan, a veteran journalist and a former member of the EU Parliament from the United Kingdom. Also in attendance were Mr. Maxime H. A. Larivé, Mr. Neil Vander Most, and Mr. Kolja Raube from University of Illinois at Urbana Champaign’s European Union Center (EUC). The speakers were welcomed and introduced by the Chair of the Economics Department, Professor David Cleeton. 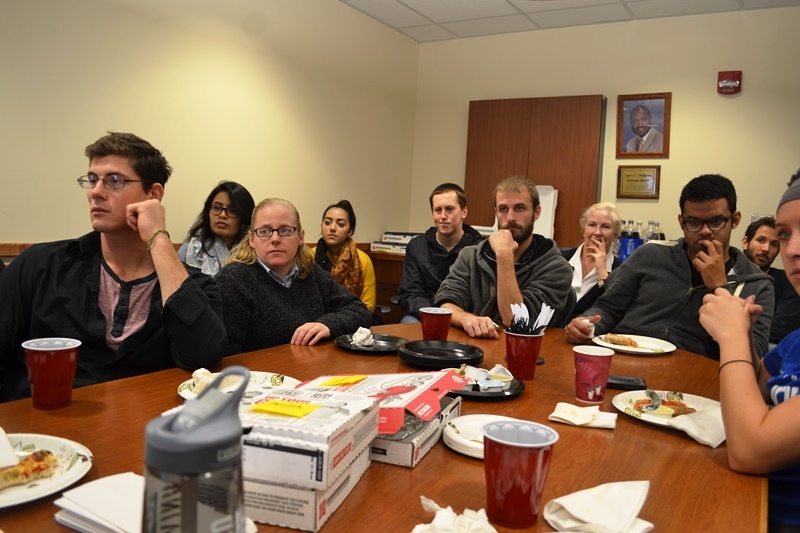 Undergraduate and graduate students, as well as faculty, from the department also attended. While hoping for the best, McGowan cautioned that a number of internal and external challenges could impede the Union’s growth. Pointing at the referendum slated for 2017 that would decide Britain’s stay in the EU, he opined it would not be wise to stay away from the world’s single largest market. Britain can go alone, but “will lose its voice in European affairs,” said the former European parliamentarian. Britain’s traditionally conservative attitude to the European Union is not pervasive among the other member nations, thinks Raube, a visiting scholar from University of Leuven. “Despite criticism, the EU has slowly started to take collective foreign policy,” said Raube. When asked what he thinks would help demonstrate such collective approach, Raube mentioned foreign aid as an example. The EU’s promising future was echoed by Mr. Larivé who said that the European Union is functioning smoothly despite a pessimism arisen from one after another crisis – whether it is the common currency Euro or Greek debts. In fact, the European Union, according to Vander Most, has a lot to offer to other nations including the United States. That the representative system at the European Parliament has facilitated conflicting voices to be heard is a great example for any democracy in the world, said Vander Most, who works as an instructor at EUC. The discussion generated questions on a range of topics including the Ukraine crisis, Syria, and human rights issues. Michaelene Cox, an associate professor, moderated the Q & A session.